One of the sessions at the DJWE Forum. 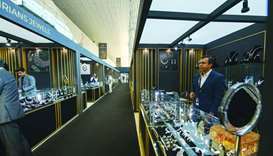 The second edition of the Doha Jewellery and Watches Exhibition (DJWE) Forum brought together international jewellery and watch designers, leading experts, as well as local and international influencers for an exciting programme of seminars curated by acclaimed brands and international watches and jewellery experts and Qatar-based academics. 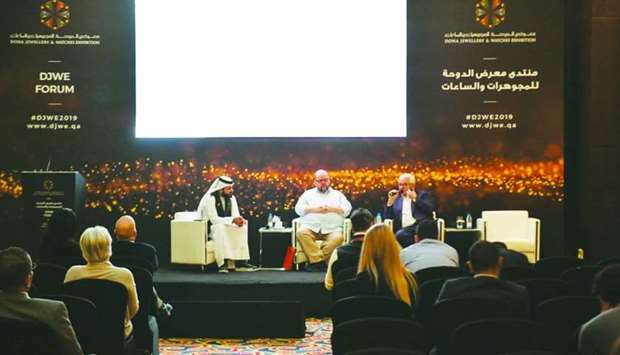 This year’s DJWE Forum, held on Thursday, offered 100 guests an insider perspective with sessions on watch collecting, natural pearls, the history of jewellery in Qatar, the influence of Indian designs, and a session with Alex Popov, chairman of the World Diamond Museum. Qatari designer and noted artist, Ahmed al-Obaidly, was the host and moderator of the Forum. Representing the new generation of regional emerging jewellery designers in a special session, “Young Jewellery Designers”, Qatari designer Nada al-Sulaiti (Hairaat Fine Jewellery); Iraq designer, Rima Mardan (Rima Mardan Fine Jewellery) and Dima Nawbar (Atelier Nawbar) from Lebanon, revealed the fascinating stories behind the pieces they create, and where they draw their inspiration from. Al-Sulaiti and Mardan spoke of the creative and practical challenges facing emerging jewellery designers and the successes in their careers so far. A graduate gemmologist born in New York, Mardan creates fine handmade jewellery. 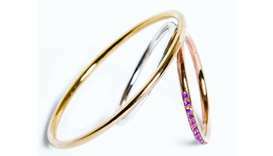 Al-Sulaiti began her career in jewellery design in 2007, when she won her first jewellery design award. She is one of 12 local designers chosen to showcase their collections under the Young Qatari Designers (YQD) initiative, in a pavilion dedicated to Qatari talent. Nawbar follows a long line of jewellers in her family history; she is now part of the Nawbar family’s fourth generation of jewellers. The Nawbar jewellery legacy was founded by Khalil Nawbar in Beirut back in 1881. One of the key sessions in the Forum was the history of jewellery making in Qatar with an outstanding presentation by Dr Jochen Sokoly, Professor of Islamic Arts and Civilisation, and Dr Najla Ismail, expert in Qatari jewellery at the Qatar National Museum. The speakers shared their vision and specialised knowledge of art and architecture of the Islamic world. Local jewellery influencers and designers were well-represented at the forum. Aisha Alfardan, prominent Qatari businesswoman, and 24th on the Forbes list of the 50 Top Businesswomen in the Arab World, shared fascinating details about her family’s collection of pearls - one of the largest private collections of natural pearls in the world. The Alfardan family’s passion and expertise in pearls is widely known, and the family is frequently consulted by brands and museums for advice. Popov spoke about the collections of diamonds and diamond jewellery, including famous stones housed at The World Diamond Museum in Moscow, and their deep history and significance. He explained about the similar heritage shared by Qatar and Russia. In June 2018, the World Diamond Museum hosted the highly acclaimed exhibition, Qatar Pearls: Treasures from the Seas and the Rivers, as part of the Qatar-Russia Year of Culture. The exhibit told the story of pearl fishing in Qatar, drawing parallels between the history of the pearl industry in Russia and in Qatar. Offering an international perspective on the successful preservation of craftmanship, From Jaipur to the World, Tarang Arora, Creative Director and CEO of Amrapali Jewels, shared the journey of Amrapali Museum of Jewellery in Jaipur, India. Arora said that while the journey of Amrapali Jewels had begun in Jaipur, their commitment to sharing the country’s living culture, seen across its regions, rituals and religions, has seen the revival of older Indian aesthetics in genres such as Tribal, Mughal, Rajput, Temple etc, and has seen them becoming recognisable across the world. The Amrapali Museum Collection is made available for study and research to scholars, designers, travellers, students and connoisseurs. It is also the inspiration for the design of the luxury jewels sold by Amrapali Jewels in their stores in India, Pakistan and the UK. Robert Punkenhofer, founder of the hybrid agency ART&IDEA, spoke on the legacy and craftsmanship of the Austrian luxury watch brand Carl Suchy & Sohne. Punkerhofer successfully revived the 196-year old brand in 2016 with the launch of Carl Suchy & Sohne Waltz No 1, a striking timepiece that he co-designed, with a dial that mimics the fine movement of a waltz and a striking guilloche design. Punkerhofer credits a multidisciplinary approach to business and a talented team of renown designers and watchmakers for this success. His advice to up-and-coming independent niche brands was to focus on outstanding handcraft and daring creativity. Geoffroy Ader, Artcurial’s international expert on modern and vintage watches, gave attendees insights into the star brands and models which drive the current vintage watch market. He spoke on how collectors perceive the value of watches, and the “nicknames” that are given to timepieces. Members of the Qatar Watch Club shared their passion for watch collecting, and encouraged watch collectors to expand their knowledge. The informative session encouraged collectors or would-be collectors to engage with their watch collections, to learn about the technical achievements behind each timepiece and the rich history of the brand.